Plumbers - Dave Sr. and Dave Jr. Thanks - I could not have done it without all of you!!!! Take you pick and tell me what your favourite is. Scroll to the end to see my favourite. PS The fabrics are beautiful too. One of my pet peeves is ugly hood fans. 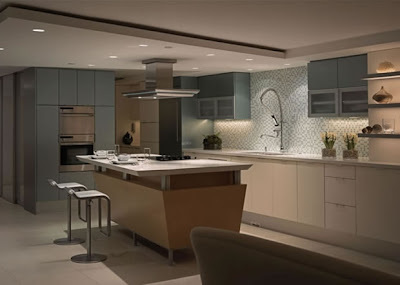 They are such a large element in a kitchen and if not handled properly can distract from the design of the kitchen, especially more so in contemporary kitchen design, as I am tending to not use overhead cabinets. The cooktop and back wall then becomes the focal point. 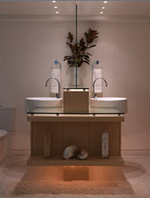 So when I saw these innovative new designs from Elica I was pleasantly surprised. 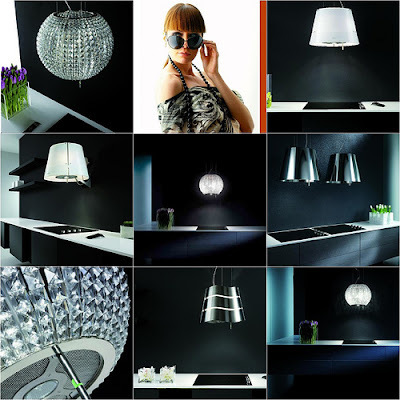 They are designed to look like a beautiful pendant handing over the cooktop and include ventilation, filters, lighting and controls. Click on the photo to enlarge. Gracie Studio Interview with Mike Gracie, President I understand that Gracie was established in New York in 1898 by Charles R. Gracie, and is still a family run business. Could you tell us a little about the legacy of your family business and how you came to be the current President? Charles R. Gracie was my great-grandfather. His atelier performed custom carving and gilding for New York’s carriage trade. To build his staff, he traveled to Italy, recruiting highly skilled workers. His clients included Rockefellers, Vanderbilts, Astors, and Diamond Jim Brady. My great-grandfather was a true salesman and energetic entrepreneur. His particular interest was Asian art, and he became a noteworthy collector of antique Chinese blue and white porcelain miniatures, an interest he shared and discussed with Herbert Hoover. His sons, James and Douglas (my grandfather) joined the company after serving in World War II. They diversified and expanded the company, opening a full-fledged art studio in Manhattan. My father, Brian, succeeded them in the 1970’s and brought the company into yet another successful area by focusing on fine Asian antiques. I have been with the company for about 12 years and my dad promoted me to President last year. He remains with the company full time as Chairman and we work together and travel together regularly. 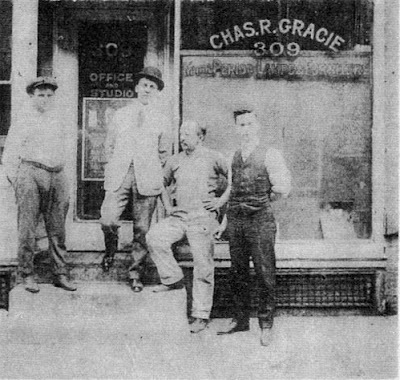 "Old Pop Gracie", Charles Gracie is in the middle with the hat You are known for your exquisite hand painted wallpapers. Are they still manufactured in Mainland China? Yes, our wallpapers are still handpainted in mainland China. This goes all the way back to my great-grandfather’s era. 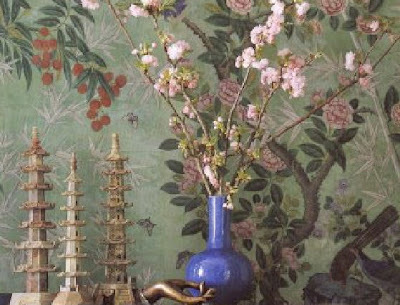 He sourced a lot of antiques, fabrics and accessories through agents in Beijing, and around 1927 he was contacted by a Beijing handpainted wallpaper studio. 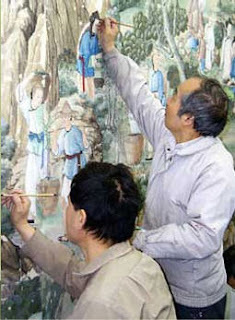 He established a relationship with that studio, and continued working with them until the communist revolution in 1949. After that, the studio relocated to Taiwan, and then Hong Kong. Finally in the mid-80’s the studio returned to mainland China. At a time when the quality of Chinese goods is in question, I’m proud that Gracie’s China studio provides a great example of luxurious, handmade products created by artists who have handed down the craft for generations. 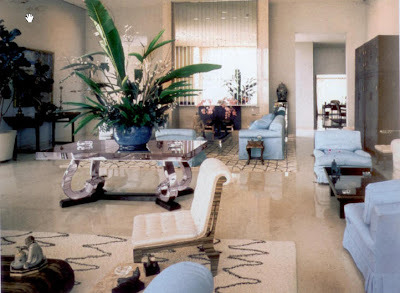 You have quite an impressive list of Interior Designers that have used your products over the decades and some are what I would call “Interior Design Icons” - Rose Cummings, Dorothy Draper, Elsie de Wolfe, Billy Baldwin, William Haines, and Michael Taylor. Are there any stories about these Icons that you could share with us? Yes, we actually still work with Dorothy Draper’s firm which is still in existence. McMillen, which was established in 1923, is another long-standing firm which Gracie still works with. 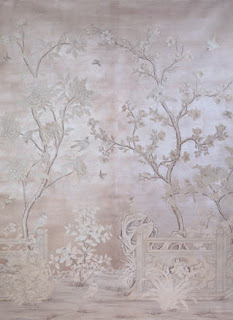 You shared with me that you restored an antique wallpaper for a design project for Michael S. Smith. 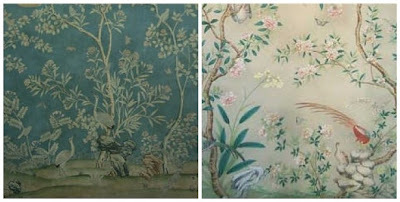 What is involved in the restoration process of your antique wallpapers? It depends on the level of work required. 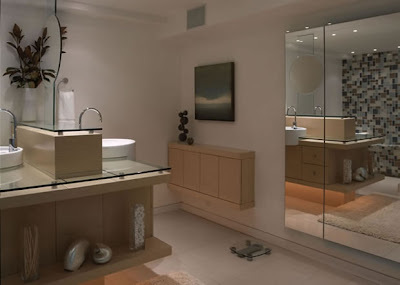 Some areas may require touch-up or adhering sections of design which have lifted off the backing. However, in the case of many antique papers, a complete remounting is required. This involves meticulously soaking the wallpaper and removing just the top layer of design before re-applying it to a modern acid-free backing paper. 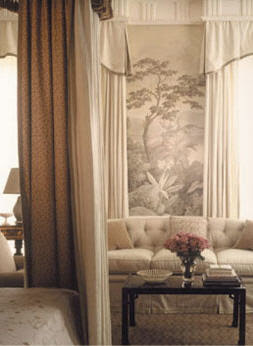 We usually also produce additions to antique wallpapers so that they can fit into the client’s space. Our artists are very talented at reproducing the style, coloration and level of antiquing to match the originals. What is your most popular wallpaper design? 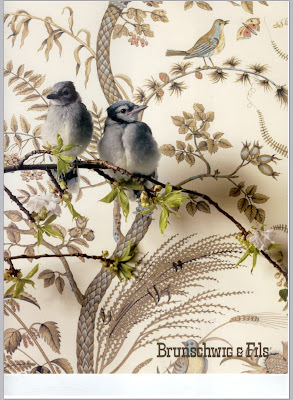 Generally speaking, our wallpapers on antiqued silver backgrounds are currently the best sellers. These papers provide a real impact with the silver ground, but the design tones are subtle and antiqued so that they appeal to a modern sense of color. 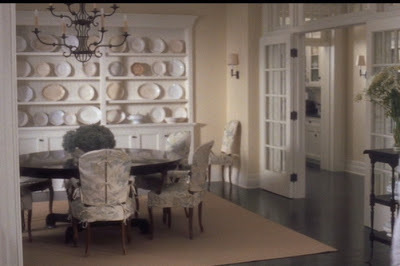 Interior Design by Greg Jordan Are there any new wallpaper designs in the planning process? We are actually re-designing much of our line of handpainted papers. This is a work in progress so I can’t be too specific. 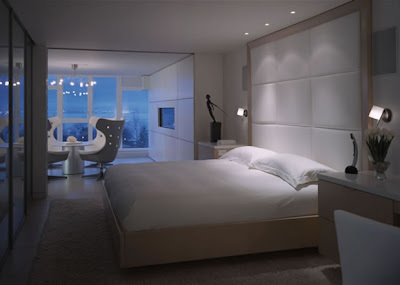 However, over the years, the quality of the work done by our studio has steadily improved. 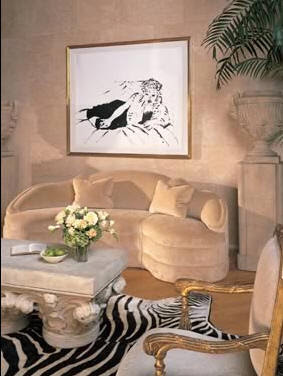 At the same time, we have kept many designs in existence for decades without alteration. Our intention is to take many of those designs and enhance them by applying the current high level of artistic talent and detail. Another exciting development is our new line of metallic and silk papers. The metallics are made of hand-applied metal leaf, and I don’t know of any product like it. We are also producing the silk papers in our studio. We were having trouble sourcing good quality silk papers, and we also wanted to be able to offer them in custom colors. We worked closely with our China studio for a year or so and came up with a product that I’m really happy with. 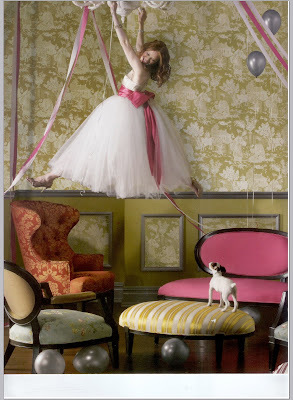 Do you see a renewed popularity in the use of your papers by Interior Designers? Although the taste for wallpaper in general seems to ebb and flow a bit, I think there’s always been a good market for our exclusive, handpainted products. Although particular designs may fall out of favor, Gracie has done a good job of keeping up with trends in color and style. 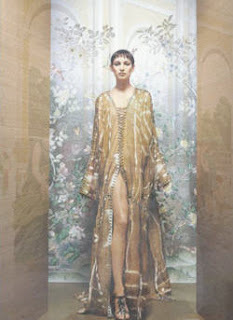 I have recently done a post on the linking of your wallpaper with the Fashion Industry. What are your views on this? Yes, we were all excited to see that! We have been actively interested in working with the fashion industry for several years and the fashion industry has reciprocated. 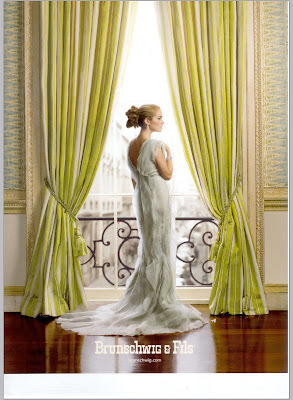 As you know, our papers have been used as backgrounds on several fashion shoots. 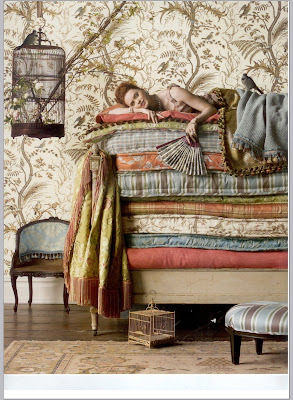 We have also produced handpainted wallpaper and custom furniture for the homes of a number of fashion designers and models. Also, for a current project we are handpainting fabrics to be used as the material for women’s couture. This is a picture that I took on the drive back from Whistler to Vancouver on the Labour Day Weekend. My dear friends, Mary and Dennis were visiting from Tennessee and the drive to Whistler is definitely on the tourist must see list. The way the sun was streaming through the big dramatic clouds was a sight of awesome beauty. I was reading the following bit of inspiration this morning and it made me think of the feelings I had when I took this picture. "Vision is one of the most profound feelings in the whole world. To see something that is grand and makes a difference in the world, to have a dream that fills your heart, a passion that inspires your day is the mark of true genius." THE LESSON FROM THIS ROOM Be Direct with your Client—Sometime in the mid-seventies, Albert Hadley was summoned to tea with his longtime friend Brooke Astor, who broke the news that she was planning to hire designer Geoffrey Bennison to revamp the library of her Park Avenue apartment, which had been done by Mrs. Parish. “Sister’s going to be furious with me,” Astor told him. Hadley expressed admiration for Bennison’s sketches, which advocated chintzes. 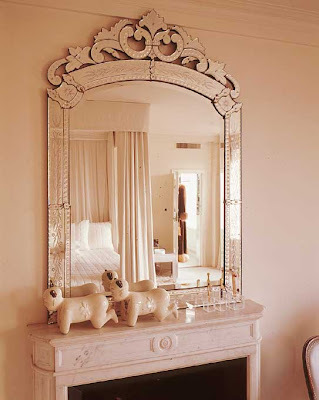 But he recoiled at the plan to keep the room’s ersatz Louis XV paneling, euphemistically known as “Park Avenue French.” “There’s nothing fake in your life except this paneling,” Hadley told Astor. 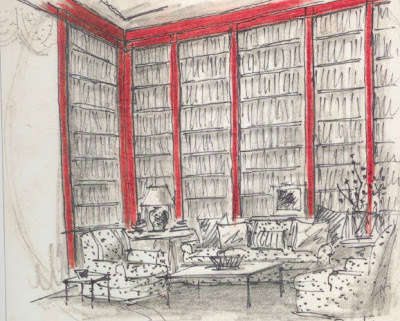 “If I were doing it, I’d make this a twentieth-century room.” Intrigued, she accepted Hadley’s plan to replace the walls with floor-to-ceiling scarlet lacquered bookcases. Ten coats of oxblood-red paint were applied for the right glaze. 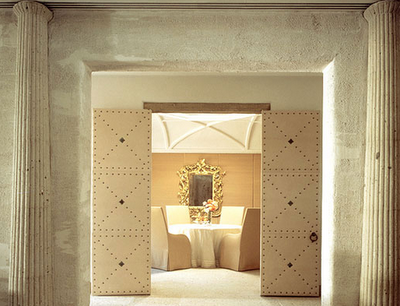 The result is, indeed, one of the most famous private spaces of the twentieth century. The finished room. 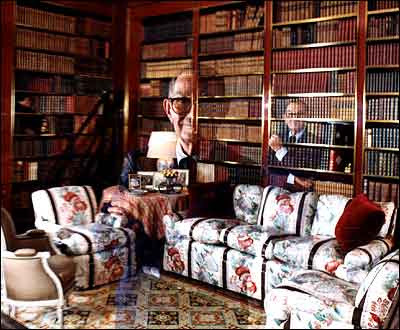 An image of Albert Hadley is super imposed in this picture. I live by this quotation of Albert Hadley's. Ever since I was a child I instinctively felt better in beautiful surroundings. Like great art and music we need our souls to be fed and nourished and it is equally important to have our homes be beautiful, in whatever form that may be. On my theme of all things "Albert Hadley" this week, Aleem Kassam, an up and coming Interior Designer here in Vancouver is leaving this weekend to go to Chicago to finish his degree in Interior Design. For a going away gift I gave him Albert Hadley's book with a note from me in the front page of the book, saying that Albert Hadley & Sister Parish have been my mentors since I was in Design School and that I hoped that he would be as inspired by his (their) work as I have been. Good luck and all the best to you, Aleem for your Interior Design schooling in Chicago! Fred Astaire and Eleanor Powell dancing to Cole Porter's 'Begin the Beguine' was the highlight of 'Broadway Melody' 1940. Notice the shiny black floor. I am just painting a floor shiny black for a client and have finally come up with the perfect paint. Hopefully it will shine like this floor from the 40's. Decorating is not about making stage sets, it's not about making pretty pictures for the magazines; it's really about creating a quality of life, a beauty that nourishes the soul. I love the bright colors that Albert Hadley uses. They act like punctuation marks. 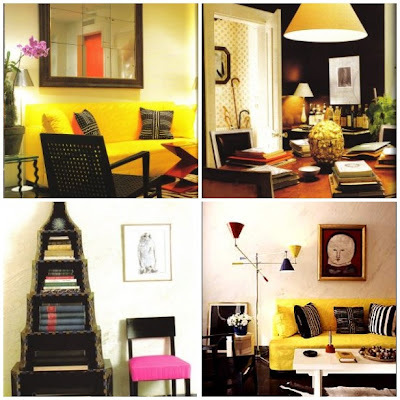 In the top left photo there is a hint of a bright orange door reflected in the mirror above the canary yellow sofa and a red zig-zag table. A constant that seems to be in all these photos is the use of black to ground everything. 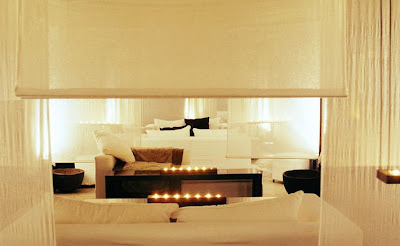 I think every room should have a touch of black. He also uses the most interesting shapes in furnishings and accessories, which seem to stand out all the more when they are juxtaposed with the bright colors and black. 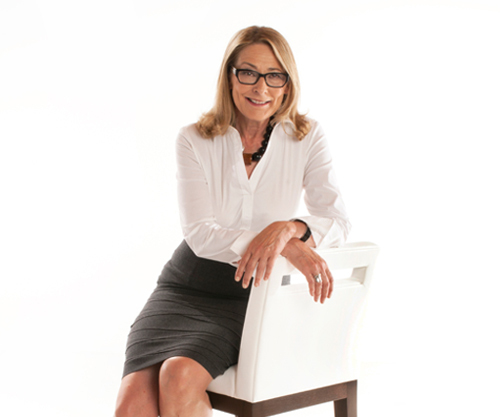 The Home Rejuvination Blog is having a contest for the 10 Most Influential Design Bloggers. Who provokes you to think about design? Who do you long to read each day? Who inspires you? Cast your vote for your favourite Design Blogs. Vote by email today! I have been getting a lot of inquiries about this kitchen that I designed that was featured in Architectural Digest December 2006. 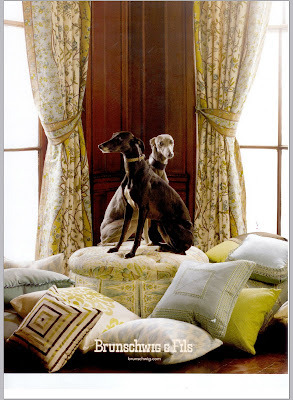 It has also been featured in Western Living Magazine August & September 2007. 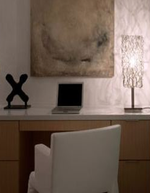 Millwork & Cabinet Design Patricia Gray Inc. I didn't want electrical outlets to be cut out of the glass tile backsplash so I had them mounted in the bottom of the upper cabinets. 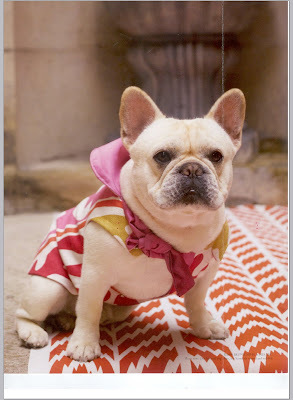 "The antique paper was purchased by Michael Smith in England, and Gracie restored and added to it. It had a lot of poor old restoration which we had to redo, and it was also not large enough to fit the room so we handpainted additional sections. Gracie's artists are expert at meticulously reproducing antique originals so that the design, coloration, and even level of antiquing are virtually indistinguishable from the original." Mike Gracie has also consented to an interview with me. So stay tuned for his interview. Thank-you Mike for clarifying the details of this wallpaper. 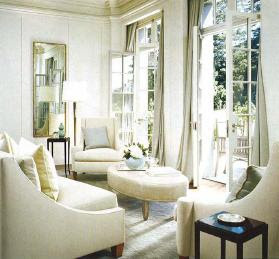 This picture is from the book Michael S. Smith Elements of Style. I have often admired this picture but had never read the photo credits for it and last week to my surprise I discovered that the trio of temples carved in soapstone were purchased from the estate of Michael Taylor. 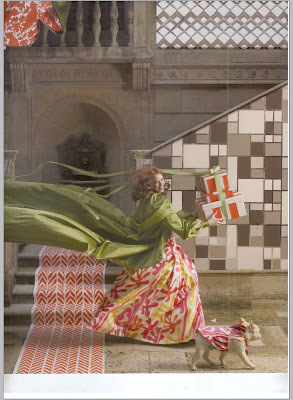 Michael Taylor was one of my early mentors and I have posted a tribute to his work. Recently I was serendipitously introduced to the work of David Ward who creates organic twig art for the Michael Taylor showrooms. I consider Michael Taylor to be a great design icon I am was very pleased to see how his legacy is living on through the work of Michael S. Smith and artists like David Ward. 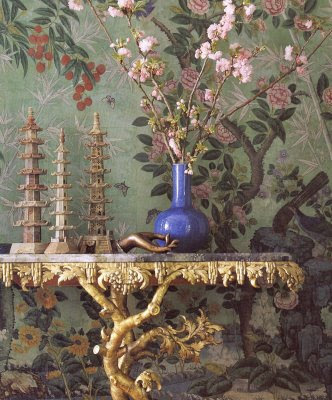 Other interesting items in this picture are the carved gilt console which is a treasure from the classical Irish residence Luttrellstown Castle and the wallpaper is Vintage chinoiserie. The house that this room is in, is located in Los Angeles designed by the architect James E. Dolena (1888-1978) and built in the early 30's and now owned by Howard and Nancy Marks. 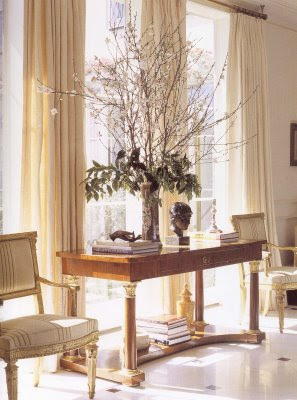 Interestingly it took Michael Taylor ten or twelve trips to Paris, Brussels, London, and New York and dedicated auction sleuthing around the world to gather the beautiful collections for this home. I orginally watched this on The House of Beauty and Culture's Blog and I haven't been able to get it out of my mind. There is a lot of sage advice here. I hope you enjoy it. 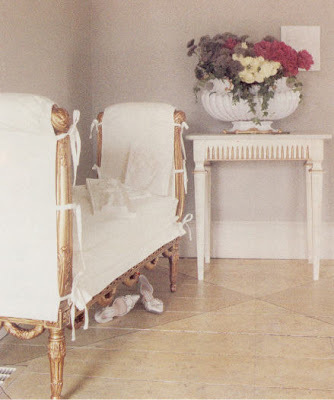 I just got word that I have received "Blog of the Day Award"
I have recently been published in Architectural Digest magazine and have been getting quite a few inquiries about the chairs I used in this article. 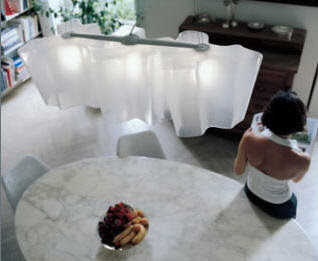 They are from Poltrona Frau designed by Paolo Rizzatto. 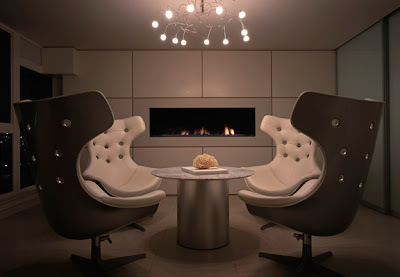 They are an extremely modern design of the bergere chair: comfortable and welcoming, but with great visual simplicity. The seat and back are obtained from a single rigid shell which is covered with a new design of the capitonnee, where the buttons are replaced with special fastening rings of polished aluminum that create transparencies. The base is aluminum. 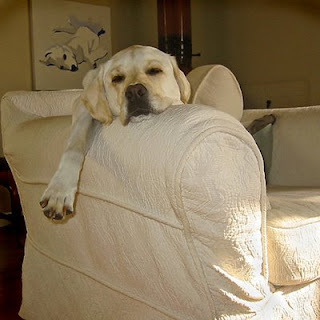 The armchair can be reclined to find the ideal relaxing position. Upholstered in white Ferrari leather. 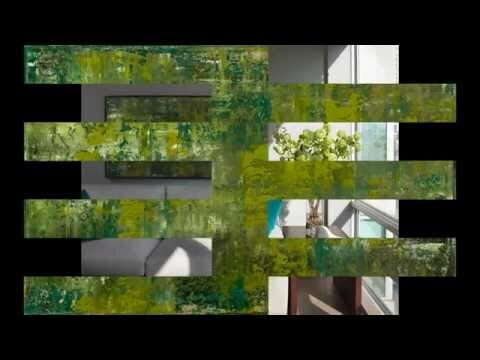 Alberto Pinto "Haute Interior Design"